September 15 2016, extending Verisign's .COM Registry Agreement through November 30, 2024. "Resolved (2016.09.15.09), the proposed amendment to the .COM Registry Agreement <https://www.icann.org/sites/default/files/tlds/com/com-amend-1-pdf-30jun16-en.pdf> [PDF, 100 KB] is approved, subject to the RZMA being executed, and the President and CEO, or his designee(s), is authorized to take such actions as appropriate to finalize and execute the Amendment." 2. I would note that based upon the comments already submitted to ICANN on this issue, there is a lot of misinformation, concern, and uncertainty, surrounding the .COM registry agreement, pricing of .COM domain names now and in the future, and Amendment32 of the Cooperative Agreement (pdf) between Verisign and NTIA which caps the price of .COM domain names at $7.85 through November 30, 2018 (subject to relief provisions). See, e.g., .Com price doubling? Here's what all that talk is about - DomainNameWire.com. 3. 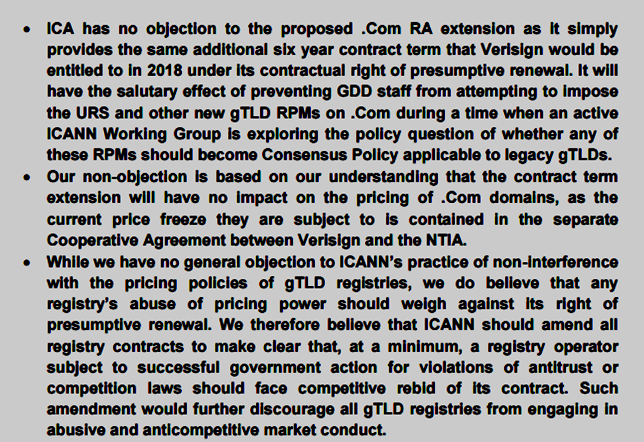 Had NTIA made clear what would happen to the CooperativeAgreement, particularly the price limitation on .COM domain names after November 30, 2018, in view of the IANA Stewardship Transition scheduled to occur upon lapse of the IANA functions contract on September 30, 2016, much of the fear, angst, frustration, hostility, and mistrust, as expressed in the many comments already submitted, could have been avoided. 4. 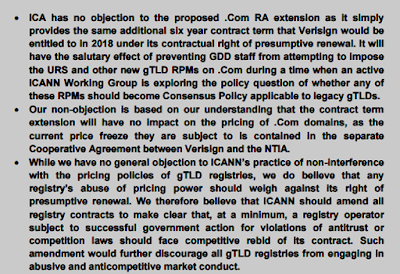 Likewise, had ICANN and Verisign made clear what would happen to the pricing of .COM domain names after November 30, 2018, should NTIA not extend the Cooperative Agreement including Amendment 32, many of the concerns already expressed in the comments could have been alleviated. 5. My understanding is this simple extension of the .COM registry agreement for six years (through November 30, 2024), is meant to accommodate the new Root Zone Maintainer Agreement (RZMA) approvedby the ICANN Board of Directors on August 9, 2016. 6. .COM is the most important TLD ( Top-Level Domain) in the world. Accordingto Verisign, the .COM “domain name base” consists of 127, 763,819 domain names as of August 12, 2016. As one of the “original” gTLDs, it has a long history which predates the existence of ICANN. The domain name registrants of .COM include “every Fortune 500 company and the world’s fastest-growing companies.” With a record of “100 percent reliability for more than 15 years” it is fitting and appropriate that Verisign continue to serve as both Root Zone Maintainer and .COM registry operator. There is no provision in current ICANN policy nor the current .COM registry agreement, nor any other gTLD registry agreement ,that provides for “a competitive public tender” barring a material, continuing, breach by the registry operator (see Annex to this comment, below). 7. I follow closely the public disclosures required of Verisign Inc. by the U.S. Securities and Exchange Commission (SEC) and the rules of the NASDAQ stock exchange. I also note that Verisign is subject to the jurisdiction of the Federal Trade Commission (FTC) and the Antitrust Division of the U.S. Department of Justice (DOJ). As a publicly traded company with a market capitalization of 8.9 billion dollars (US), it has the resources and incentives to continue providing reliable services to the global internet community as Root Zone Maintainer and .COM Registry Operator. 8. Finally, I note in passing the inappropriate comments submitted by INTA and the IPC. First, INTA, the International Trademark Association, has a conflict of interest in submitting any comment to ICANN since ICANN is a member of INTA, the worldwide lobbying organization for trademark attorneys and other trademark interests, and ICANN staff have “coached” INTA members on how to “lobby” ICANN on policy-making, see Why Did ICANN Become a Member of Trademark Lobbyist Group INTA? Second, as both INTA and IPC know, all Rights Protection Mechanisms are currently under review as noted by Philip Corwin in the comment submitted by the ICA (see above), and the ICANN Board has made it clear it is not appropriate to extend new gTLD RPMs to legacy gTLDs such as .COM, see DomainMondo.com:ICANN Renews .CAT, .PRO, .TRAVEL, RAs with URS Included: "Accordingly, the Board's approval of the Renewal Registry Agreement is not a move to make the URS mandatory for any legacy TLDs, and it would be inappropriate to do so." --ICANN Board of Directors. In fact, cybersquattingcomplaints against .COM domains are dropping and there is no reason to extend any of the new gTLD RPMs to .COM. Instead, INTA and IPC could better spend their time educating their own members and participants on not filing meritless UDRP cases or otherwise engaging in abuse of the UDRP and other legal processes—see this comment by attorney John Berryhill. This REGISTRY AGREEMENT (this "Agreement") is entered into as of 1 December 2012 by and between Internet Corporation for Assigned Names and Numbers, a California nonprofit public benefit corporation ("ICANN"), and VeriSign, Inc. a Delaware corporation. Section 1.1 Effective Date. The Effective Date for purposes of this Agreement shall be December 1, 2012. Section 4.1 Term. The initial term of this Agreement shall expire on November 30, 2018. The Expiration Date shall be November 30, 2018, as extended by any renewal terms. Section 4.2 Renewal. This Agreement shall be renewed upon the expiration of the term set forth in Section 4.1 above and each later term, unless the following has occurred : (i) following notice of breach to Registry Operator in accordance with Section 6.1 and failure to cure such breach within the time period prescribed in Section 6.1, an arbitrator or court has determined that Registry Operator has been in fundamental and material breach of Registry Operator's obligations set forth in Sections 3.1(a), (b), (d) or (e); Section 5.2 or Section 7.3 and (ii) following the final decision of such arbitrator or court, Registry Operator has failed to comply within ten days with the decision of the arbitrator or court, or within such other time period as may be prescribed by the arbitrator or court. "Section 7.3 Pricing for Domain Name Registrations and Registry Services ... (c) Price for Registry Services. The price for all Registry Services subject to this Section 7.3 shall be the amount, not to exceed the Maximum Price, that Registry Operator charges for each annual increment of a new and renewal domain name registration and for each transfer of a domain name registration from one ICANN-accredited registrar to another. (d) Maximum Price. The Maximum Price for Registry Services subject to this Section 7.3 shall be as follows: (i) from the Effective Date through 30 November 2018, US $7.85; (ii) Registry Operator shall be entitled to increase the Maximum Price during the term of the Agreement due to the imposition of any new Consensus Policy or documented extraordinary expense resulting from an attack or threat of attack on the Security or Stability of the DNS, not to exceed the smaller of the preceding year's Maximum Price or the highest price charged during the preceding year, multiplied by 1.07." Read all comments submitted here. Comments Close Date 12 Aug 2016 23:59 UTC.